The Filipino champ Manny Pacquiao announced and confirmed his next fight for this year which is scheduled this coming December 1, 2012. But he has still no opponent yet to confirmed. They are still choosing among these three top boxers such as Juan Manuel Marquez, Timothy Bradley and Miguel Cotto to be Manny's next opponent this coming December. And when Manny asked about why his next fight moved to December 1 and who will be his next foe. He simply said, "Masyado kasing malapit [sa huling laban] eh. Kelangan at least 6 month bago lumaban ulit." Manny added, "Wala pa," "'Di pa kami nag-uusap ulit ni Bob Arum, by next month siguro." Meanwhile, Rep. Manny Pacquiao has been titled as the new Habitat for Humanity Heroes' ambassador. 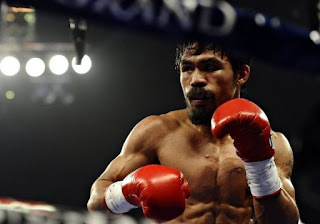 Comments or suggestions about "Manny Pacquiao confirmed next fight on December 1" is important to us, you may share it by using the comment box below.